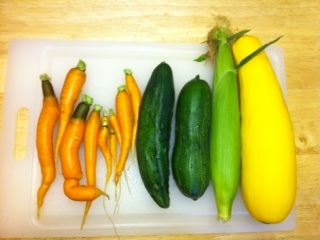 my weekend raids in the garden just seem to be getting larger and bulkier every week – TOTALLY loving it!! the first ear of corn from the garden was grilled right in its husk and eaten within moments of coming off the grill – patiently stalking the bed for the next ones to be ready, dayummmm that was tasty! I love beets most anyway they are prepared but I have never eaten them raw. I can’t wait to try your recipe. 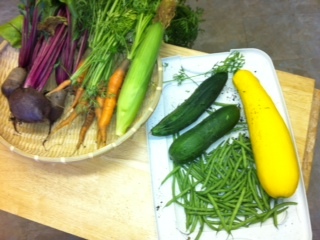 The only thing I have harvested from my garden so far is herbs Your harvest looks great. I was thinking the same thing until I came across this recipe. I hope you’ll be as happily surprised as I was! I had the good fortune to be able to enjoys these lovely little beet boats of delight. 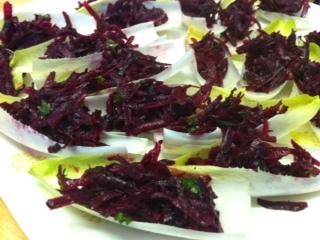 The sweetness of the beets was a nice contrast to the tartness of the belgian endive.